Jazz has Billy Strayhorn and Duke Ellington, rock has Lynyrd Skynyrd and Zydeco has Canray Fontenot. 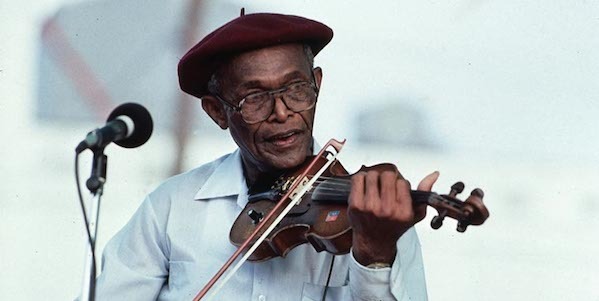 The Creole fiddler was an award-winning Louisiana musician whose original compositions withstood the test of time to become standards in traditional Zydeco and Cajun music. Two songs in particular -“Les Barres de la Prison” and “Bonsoir Moreau” – have been adopted by the newer generations of Zydeco artists, showing up again and again on recorded albums and live on stage. In 1983 folklorist and archivist Alan Lomax took his crew to Basile, LA and filmed Fontenot playing these two standards on the porch with his friends Freeman Fontenot and Alphonse “Bois Sec” Ardoin. Watch the clips below and learn more about Canray Fontenot here.